I have discovered an entirely new appreciation for quinoa, a healthy grain that is high in protein. Quinoa is superior to that of many other grains because it contains all the essential amino acids. Quinoa is a very easy to cook as it cooks in just 15 minutes, and can be used in salads, soups, or even as a side grain dish. What I like best about quinoa is that it has only a subtle nutty flavor and takes on the flavor of other ingredients you may add to it. For this salad, I kept it simple adding just tomatoes, cucumbers, onions, and fresh mint, and then I dressed the salad with a light lemon vinaigrette. This salad also keeps really well, so is a great healthy lunch option for those that pack a lunch. Although I kept this salad simple, you could give it a Greek flair by adding in some chopped black olives, and crumbled feta cheese, or an Italian flavor by replacing the mint with basil and adding chopped artichoke hearts and cubes of fresh mozzarella. I garnished my salad with a few slices of avocado, but a nice grilled chicken breast would be another option creating a complete meal. 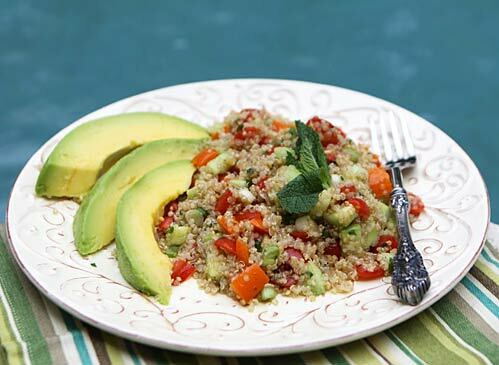 Quinoa is a high protein grain that works as a blank canvas for salads. Toss all the ingredients except those for the dressing together in a bowl. Add the lemon juice, salt & pepper and a drizzle of olive oil. Toss, taste, and adjust seasonings and oil as needed.